For any review I do, I try my best to be accurate, fair, and as unbiased as possible. I make sure to really test the gear, not just open up a box and pontificate. And when a manufacturer sends me gear to test and review, I’m obligated by the FCC to include a standard disclaimer. Try as a I might to be gear neutral, I realize that some amount of bias is bound to creep in, although I am not afraid to be critical, which at times has strained my relationships with some vendors. However, in this review I have to come clean: I’ve known George, the owner of AntiGravityGear.com, for many years, even before I became a hammock nutter. Prior to hammocks, I was venturing deeper into lightweight backpacking, and I was eating up everything George had to offer: alcohol stoves, insulated pot covers, bear bags—you name it. George wasn’t as fond of hammocks back then, but he decided to try one out a few years ago and he’s been sold—hook, line, and sinker—ever since. When I met him at Trail Days in Damascus, Virginia, it was all he could do to restrain his excitement about Whoopie Slings, UCRs, and Dynaglide. 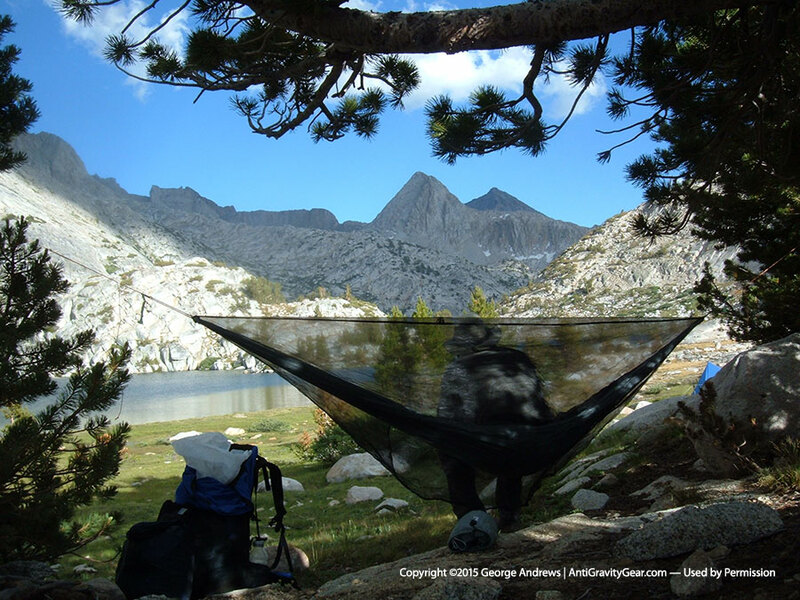 Fast forward to the end of 2014: George unveils his Quicksilver Hammock system. It’s a straightforward set-up (hammock, bug net, and tarp) but with the focus being lightweight materials, simple design, and low-frills accessories—a nice addition to the companies other offerings. George was kind enough to send me a complete kit to review. 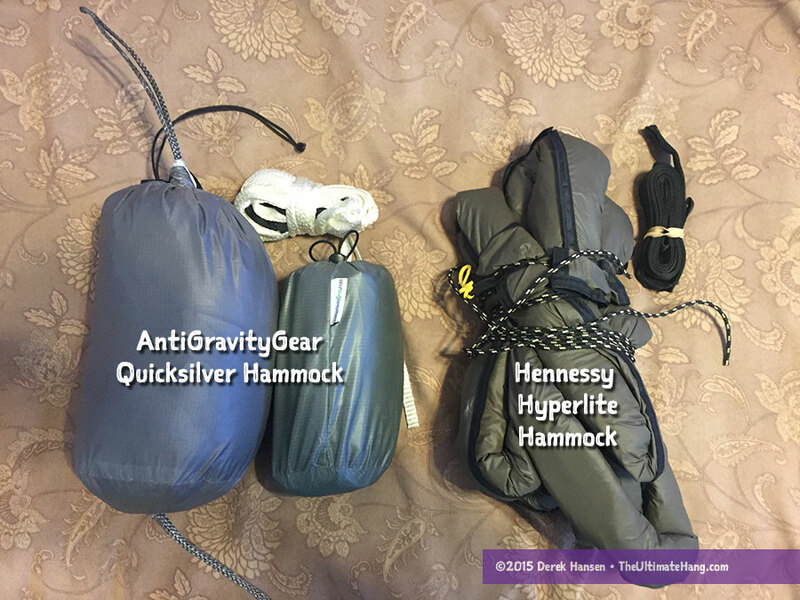 The AntiGravityGear Quicksilver Hammock System (37.3 oz/1,057 g) compared in size to the Hennessy Hyperlite Hammock System (36 oz/1,023 g). The comparison isn’t equal, as the Quicksilver system has a large Hex tarp and stakes and the Hennessy pictured here uses a stock asym tarp. The AntiGravityGear Hammock is positioning itself as a lightweight kit—a hammock that is designed as a single unit, with a bug net, tarp, and suspension all working together. There are not many hammock kits on the market, but Hennessy is one of the most well-known. The Hennessy Hyperlite model is the lightest in their line and weighs a mere 36 oz (1,023 g), and that’s not even an apples-to-apples comparison, as the Hyperlite doesn’t include stakes and uses a smaller tarp. There are many ways to scrap together an ultralight hammock system, but the Quicksilver certainly delivers a compelling option for folks looking for an all-in-one lightweight camping hammock. Dimensions 132 x 60 in (335 x 152 cm) 132 x 60 in (335 x 152 cm)—true to size. Hammock — The Quicksilver Hammock uses a straightforward, gathered-end, rectangular design, but is slightly longer at 11 ft (335 cm) than “typical” hammocks. The fabric has a steely sharkskin grey color, but with a shimmer that does give a “quicksilver” impression. The stitching on the rolled hems is unbelievably tight. This hammock represents the quality I’ve come to expect from cottage vendors who care deeply about the finished product. When I first laid in the hammock, I immediately noticed that something was different. Depending on what direction I laid, or if I flipped sides, I could get a better lay. Upon closer inspection, I noticed that the hammock was gathered in a way I’ve never seen before. The continuous Amsteel loop that gathers the hammock had been threaded around the end channel before going through it, creating a Square Knot shape. What this does, as far as I can tell, is tighten up one side a little more than the other, which creates a unique lay and pockets without any additional material. One thing I noticed is that unlike a hammock that has been gathered evenly on both sides, I had to lay in a specific diagonal to ensure my head or feet didn’t inadvertently slip off. It was interesting. The hammock fabric has a nice hand, and as a 1.1 oz nylon, has a good deal of stretch. I’m usually not too fond of stretchy hammocks, personally, but I haven’t noticed the same type of problems I’ve had with other lightweight hammocks. I think this is due to the length. I felt the same way about the BIAS Weight Weenie Micro hammock, which uses a 1.0 oz nylon. Yes, it stretches, but it isn’t as bad as smaller hammocks where I would barrel my shoulders. The fabric creates a certain amount of static electricity, common with this type of material. Stuff Sack — The stuff sack uses a basic Bishop Bag design with a simple sewn button hole instead of a grommet on one end. The circular end cap helps open up the stuff sack for easy packing. 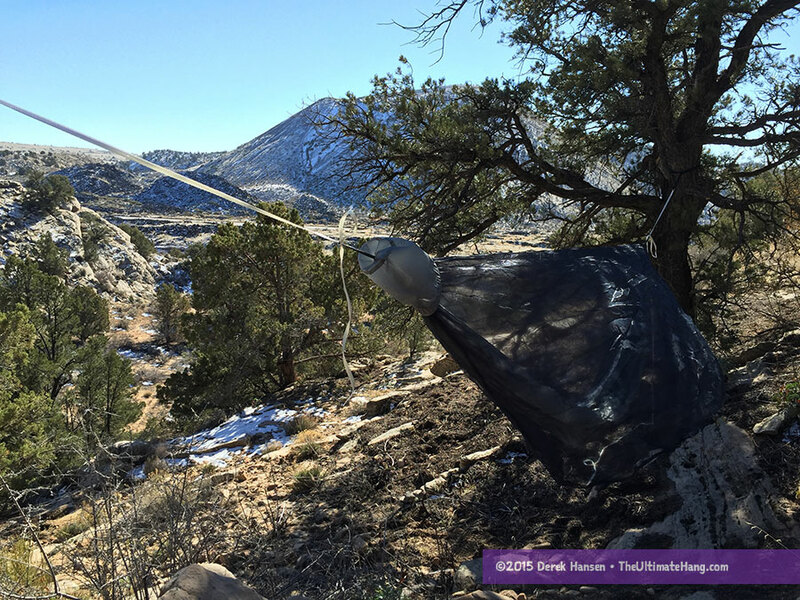 Like a double-sided stuff sack, a Bishop Bag makes packing a little easier by keeping one end of the hammock attached and tensioned. The hammock is generously sized and has one unique construction method that I find very interesting. The ends have sewn channels, but it gathered using a Square Knot method. This affects the hammock by pulling one edge tighter than the other, making an interesting lay. I’ve found that I lay better in one direction than the other because of this. If you find that this gathering technique doesn’t work for you, it is a simple matter to switch to a different method. The Becket Hitch Suspension System — The Becket Hitch is one of my favorite, no-hardware suspension systems for a hammock. I’ve been using this for years, primarily indoors, and was pleased to see AntiGravityGear use it for their hammock. 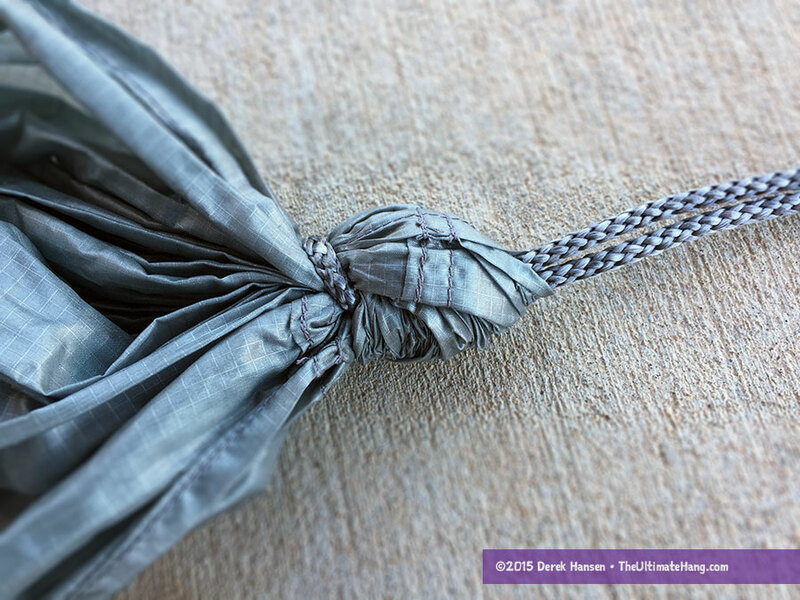 The hitch is similar to the Sheet Bend, but is tied to a fixed eye instead of a bend. The knot has been used for centuries (or longer) in South America for hanging hammocks. It works best with thicker line or when the lines are of different diameters. The combination of an Amsteel loop and the 1/2 inch (1.27 cm) Muletape works fantastic. The slippery Becket Hitch is relatively easy to loosen, and the lubricated Muletape makes it even easier. 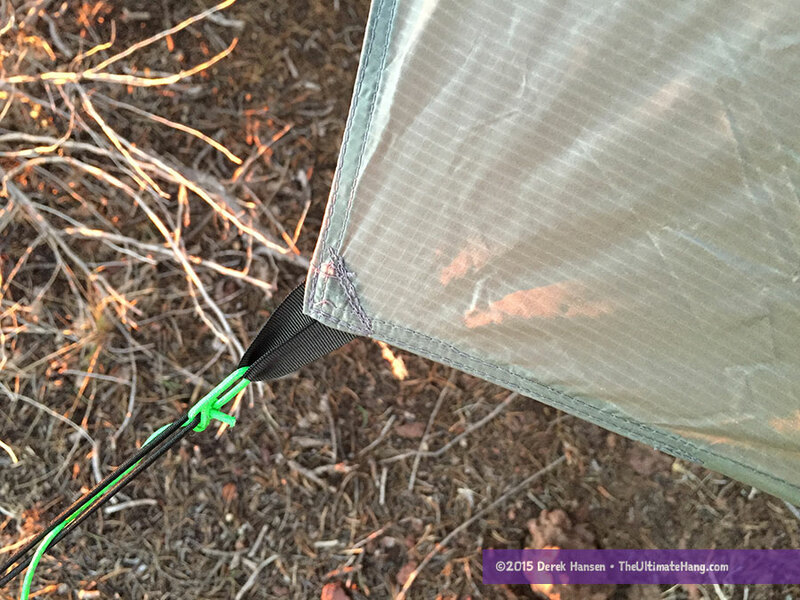 AntiGravityGear uses a length of webbing that is wider than the Muletape to provide better protection around a tree. The Muletape is pretty long, and if you want to save a few more ounces, I recommend trimming off a few feet. I cut of 7 ft (213 cm) of Muletape off my suspension, which was still long enough for most of my hangs, and reduced the suspension weight to 3.4 oz (98 g). I was curious how the AntiGravityGear suspension system stacked up to other ultralight hammock suspension, so I weighed and measured a few top contenders. For its overall length, the Muletape system is extremely light. By normalizing the weight, the Muletape suspension is a real contender. One of the interesting and unique features of this Fronke-inspired bug net is that the ridge line is attached to the net instead of the hammock. The design ensures that the bug net cannot be pulled too tightly, just like hammocks with structural ridge lines. The sag in the hammock then becomes fixed with the bug net installed, which changes the lay. The bug net is cut and fitted so that it pulls the sides pretty taut when I lay diagonally. This helps keep the bug net away from my head just slightly. I can’t say that this will work with everyone, and I like to recommend using a side pull-out to keep the netting from touching your face, which can allow bugs to bite through the net. 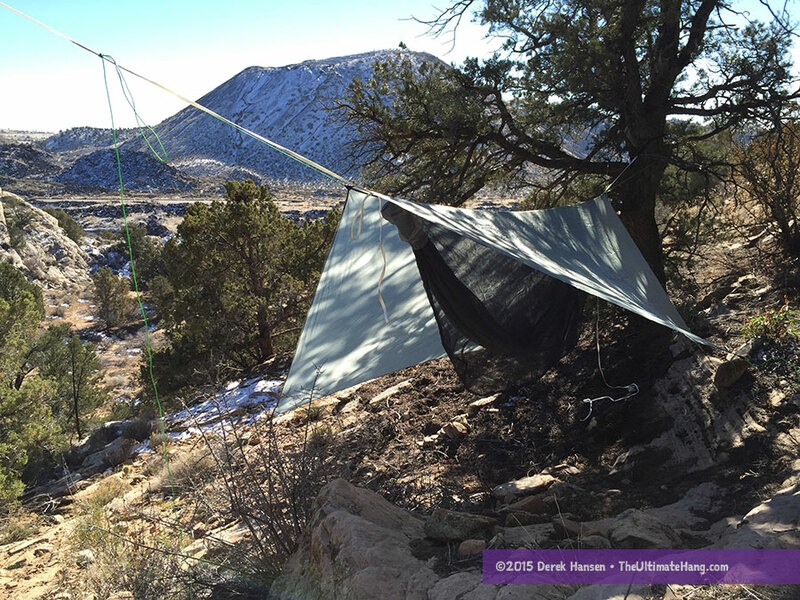 The Quicksilver Ultralight Tarp is more simply constructed than the Storm version, with a basic hex design and featuring gentle catenary-cut edges. The fabric is a light 30D 1.1 oz silnylon with very tight seams and edging that again, focuses on weight savings and simplicity. The workmanship is exacting, and I’d go cross-eyed to get seams allowances as small. Instead of edging, they use a simple rolled hem. You can tell that George is a gram counter. Speaking of grams, every one has been accounted for, down to the titanium stakes, which are included with the tarp. The listed weight includes everything: stuff sack, guy lines, and tarp. The reflective guy lines are easy to knot and wrap. I was also impressed with the included titanium stakes (4) packed in some cardboard. The Storm Tarp includes doors and corner pockets, which add some weight, but more protection and function. For me, I like add-on doors that I can bring on certain trips and leave at home when not needed. If you are looking for a lightweight hammock kit, the Quicksilver gives any system some stiff competition. 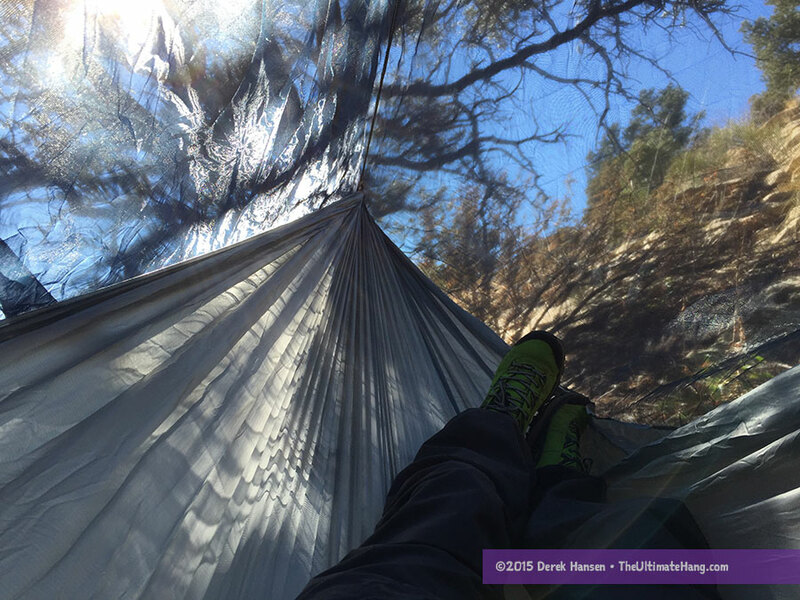 It is designed with few frills, which is appealing to many UL hikers, but I wouldn’t consider this a perfect hammock for everyday recreational users. There are some quirks with the Fronke-style bug net, and while it is fairly easy to get in and out, it can be tricky to get under quilts attached, and having a side pull-out can keep the netting off your face. The netting is the one thing that weighs this otherwise ultralight hammock down. It also takes up nearly 2/3 of the stuff sack. A trimmed-down, fitted net that was sewn with a light zipper might be slightly lighter, but you also lose some of the modularity and customization with the design. It’s a tradeoff of simple ideas and functionality. For me, simplicity is perfection. Some hammocks have so many tie-outs, guy lines, and storage pockets that it becomes a self-made booby trap with unused accessories. The Quicksilver system, in contrast, is streamlined, light, and simple. It’s ideal for folks who want the benefits of sleeping in a hammock, but would rather soak in the views of the outdoors instead of collecting shelves of “bling” to complicate the experience. The Quicksilver UL set sounds similar to my DD Hammocks Superlight set. Have you reviewed? I’m 5’/female and will be overnighting in it for the first time at this week’s Florida Sherpa Hang. Hammock is 270 grams with huggers and soft shackles. I’m willing to ship it to you if you’d like to review. Would be a good comparison. There are several YouTube videos. I’d love to do a review. I’ve only tested the DD Jungle Hammock, which is a much more involved product, I’m sure. The DD Superlight kit has been on my radar. Could you tell me what is included in the Hennessy Hyperlite system that you state the weight is 50.3 oz? I have an early model Hyperlite w/o the zipper and the total weight with stock rainfly and suspension system and stuff sack is 26.85 oz. The Hennessy website gives the weight as 1# 12 oz with zipper. Mine is a zipper model from last year. Snake skins XL. Asym sil tarp. Stock rope suspension. 4′ straps. I was surprised to see the weight difference on my scale, but I will double check it tonight. David, I owe you! Thank you for fact-checking me. I had accidentally weighed my Hennessy Deep Jungle, not the Hyperlite. They are both stuffed in SnakeSkins and I made a very amateur mistake. I’ve fixed the post with the correct weight. The Hennessy Hyperlite I have weighs 34 oz (966 g). This includes the hammock with side zipper entry, XL SnakeSkins, stock rope suspension, and an asymmetric silnylon tarp. Everything is stock. Add a set of straps (57 g) for a total of 36 oz (1,023 g). 36 oz still sounds heavy. Mine is all stock – no snake skins, but in a stock stuff sack, which should be approx. the same weight as the snake skins. I don’t understand what the added 2 oz set of straps are. Mine has the stock straps. This is not really important, I am just curious about what may be different between our hammocks. Yours is bottom entry, correct? The zipper on my model adds some weight. Each hem on the zipper is independently edged with bias tape, so there are many places where the ounces add up. The straps are basic Hennessy tree huggers, about 4 ft long. These newer models also have a grosgrain webbing and toggle on the inside that can be used to pull away the bug net to one side. I would say that there are enough changes between our two models to account for the few ounces of difference, which is much closer than the Deep Jungle I originally measured! Even in the same batch of hammocks, I’ve seen slight variations of weight, regardless of manufacturer. There are just so many little things that can add grams here and there. Yes, mine is a bottom entry. You are probably right about all the differences adding up. I just wouldn’t have thought that they added up to 9 oz. I enjoy reading your blog. One of my favorite tips is the Garda Hitch with welded steel rings from the hardware store, although I couldn’t find 8 gram rings like you had in your video. The smallest I could find was 3/4″ ID at about 18 grams for two. They make it a cinch to tighten and center the hammock. I have some 1/2″ bull-tape (found at flea market for $3.00 for 100 ft) to use with the steel rings and whoopie hooks making my total suspension weight about 2 oz. with 5 ft of bull-tape on each end. Also borrowed some tips from Sgt Rock’s suspension. This should make my total Hyperlite weight about 24 oz. 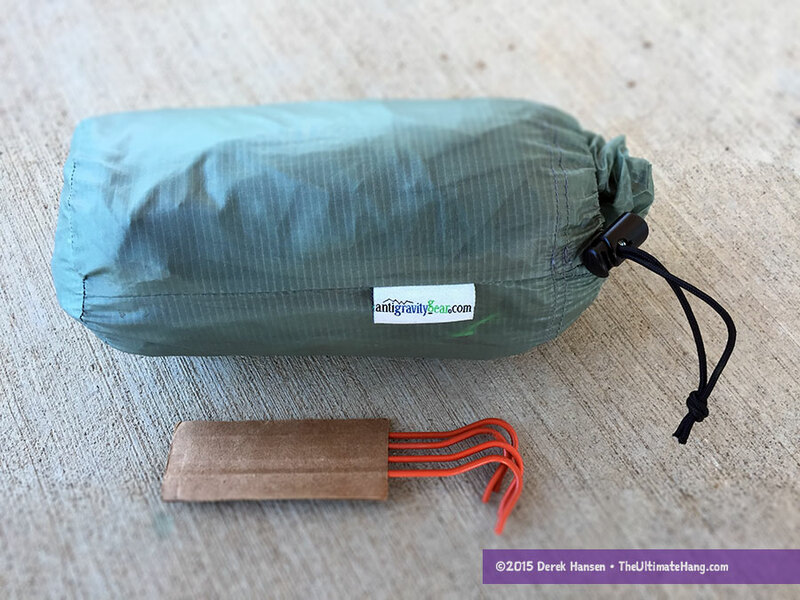 Also, want to get a Zpacks 8 1/2 X 10 or 11 cuben tarp (when I save some $$$$) for a whole lot more coverage that should be about the same or less weight than the skimpy stock asym tarp from Hennessy. This would also allow me to go to ground if needed when I take one of my grand-kids backpacking. Great review. And timely. I’m trying to shed weight for this years hiking season. The tarp weight kills this kit. I’m now in a full blown comfort rig: WBRR Bridge with carbon poles and a superfly. This above kit would save me 21-1.5 pounds easily. Would be great to see pictures differences of the standard tarp vs storm tarp. Super review, thanks!